The housing debate is hotting up with news that government will publish a new consultative Housing Green Paper in the next two weeks. Some reports suggest they aim to publish next Thursday (July 12) when tenants, trade unionists, councillors and MPs will be taking part in the DCH National Conference in Central London. 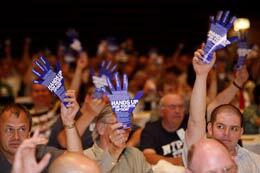 Union delegates have been putting their "Hands up for the Fourth Option" at recent conferences. Organise at an appropriate meeting/event in your area for tenants, trade unionists and councillors to join them. Order hands from DCH £10 for 50 (photo Simon Clark eyebox.net). We've always said this campaign isn't a spectator sport so, if you believe in defending, improving and building new council housing, come to the conference and make sure there is a broad delegation of tenants, trade unionists and councillors from your area. Ask your council to fund a delegation on the same basis that they send people to other similar events. If the council refuse contact local trade unions for financial assistance and shared transport. Please email registration details in advance to help smooth the organisation or register on the day. It's also clear that there should be an immediate moratorium on local authorities bullying tenants to accept stock transfer, PFI or ALMOs - or mass demolition of homes, sale of council land and properties. Speaking at the DCH Fringe Meeting at the Local Government Association conference yesterday (Wednesday) Frank Dobson MP argued "It is imperative that there now be a moratorium on any further transfers or ALMOs until the government announces their new policy”. If your authoritiy is 'consulting' tenants demand they put it on hold and make sure tenants are aware we're fighting to secure a change in government policy. No details of the Green Paper are yet known (keep an eye on the DCH website and Press Archive) but the new Prime Minister has a choice: if he wants to earn a reputation for listening to the people and respecting tenants' choice then government has to recognise the overwhelming support for the 'Fourth Option' of direct investment in council housing and announce a change in policy. And while it is reasonable to give the new Prime Minister some time to settle into his new job he's no novice and the arguments around investment in council housing have been fully debated. So we'll be looking for a clear timescale involving days and weeks - not months and years - to implement the changes and put the necessary funding in place.